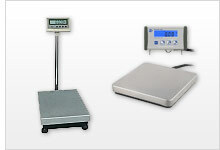 On our website you will find a wide range of models of weighing platform. The weighing platform, depending on the model, meets with all technical requirements and weighing standards within all industries. We can offer you a wide range of weighing platform for many different sectors such as: industry, laboratories, packaging companies, home, etc. Each weighing platform is delivered with a calibration, a verification and/or a laboratory certification (ISO calibration). PCE-PB 150N is a multipurpose industrial weighing platform or scale. This heavy-duty digital balance features a removable stainless steel pan for easy cleaning. The scale weighs units in either grams (g), kilograms (kg), pounds (lb) or Newtons (N), and is powered by battery or AC power. Ideal for shipping, receiving, manufacturing and general purpose use, this versatile scale has a large LCD for easy viewing, simple 4-button operation and a USB interface for connecting to a PC. PCE-PB 60N is a multipurpose industrial weighing platform or scale. This heavy-duty digital balance features a removable stainless steel pan for easy cleaning. The scale weighs units in either grams (g), kilograms (kg), pounds (lb) or Newtons (N), and is powered by battery or AC power. Ideal for shipping, receiving, manufacturing and general purpose use, this versatile scale has a large LCD for easy viewing, simple 4-button operation and a USB interface for connecting to a PC. PCE-PCS 30 is a weighing platform, scale or balance with accurate weighing and piece or part counting functions. Ideal for use in laboratory, office, inventory and miscellaneous industrial applications, this portable scale can be powered by battery or by the included electric power supply. The scale's built-in RS-232 port enables data transfer and printing. PCE-PCS 6 is a weighing platform, scale or balance with accurate weighing and piece or part counting functions. Ideal for use in laboratory, office, inventory and miscellaneous industrial applications, this portable scale can be powered by battery or by the included electric power supply. The scale's built-in RS-232 port enables data transfer and printing. Extremely affordable, Weighing Platform for everyday use. The platform scale has a platform size 600 x 900 x 80 mm. The capacity of the Weighing Platform is 75 kg or 150 kg. Initialise the balance, weigh - it could not be easier. Extremely affordable, Weighing Platform for everyday use. The Weighing Platform has a platform size 600 x 900 x 80 mm. The capacity of the Weighing Platform is 75 kg or 150 kg. Initialise the balance, weigh - it could not be easier. The weighing platform PCE-SD 30C is a low-cost robust verifiable system balance. The calibration of the weighing platform is according to the trading class M III. The sturdy foundation of the weighing platform is made of painted steel and features a plastic-coated steel platform. The weighing platform PCE-SD 153C is a low-cost robust verifiable system balance. The calibration of the weighing platform is according to the trading class M III. The sturdy foundation of the weighing platform is made of painted steel and features a plastic-coated steel platform. The weighing platform PCE-SD 303C is a low-cost robust verifiable system balance. The calibration of the weighing platform is according to the trading class M III. The sturdy foundation of the weighing platform is made of painted steel and features a plastic-coated steel platform. The weighing platform PCE-SD 63C is a low-cost robust verifiable system balance. The calibration of the weighing platform is according to the trading class M III. The sturdy foundation of the weighing platform is made of painted steel and features a plastic-coated steel platform. The Weighing Platform PCE-RS 2000 is designed for stationary use. The robust construction makes this Weighing Platform particularly well suited for weighing large objects. The Weighing Platform is made of painted steel. Verifiable waterproof Weighing Platform in stainless steel with separate indicator (no corrosion). The Weighing Platform is manufactured to IP67, dust-tight and thus can also be temporarily submerged completely under water (up to 1 m depth). Verifiable waterproof weighing platform in stainless steel with separate indicator (no corrosion). The multifunctional scale is manufactured to IP67, dust-tight and thus can also be temporarily submerged completely under water (up to 1 m depth). The weigh platform PCE-IS01 is a professional system for counting, and consists of a quantity and a reference scale. The reference scale takes on the smallest components while the balance calculates the number of pieces. This weigh platform is particularly well suited for inventories. The weigh platform PCE-IS02 is a professional system for counting, and consists of a quantity and a reference scale. The reference scale takes on the smallest components while the balance calculates the number of pieces. This weigh platform is particularly well suited for inventories. The weigh platform PCE-IS03 is a professional system for counting, and consists of a quantity and a reference scale. The reference scale takes on the smallest components while the balance calculates the number of pieces. This weigh platform is particularly well suited for inventories. The weigh platform PCE-IS03M with type approval is a professional system for counting, and consists of a quantity and a reference scale. The reference scale takes on the smallest components while the balance calculates the number of pieces. Thus, the weigh platform is particularly well suited for inventories. The verifiable Weighing Platform PB-60 is of very robust construction and easy to transport thanks to a built-in carrying handle. In addition, the platform scale is lightweight and has up to 300 hours of battery operation, making it ideal for mobile use. The display on the Weighing Platform can be removed and connected to the unit via a spiral cable, which can be positioned freely. The KDQ 15 is a verifiable weigh platform for statistical control (according to Directive CEE 76/211 / EWG) or for user-specific, statistical controls. The weigh platform is ideal for fast and reliable statistical control of packaged products. The standard version of the weigh platform is designed according to OIML R-76 / EN 45501.